I truly felt like a kid in a candy store at the P.S. Arts Express Yourself annual arts festival. 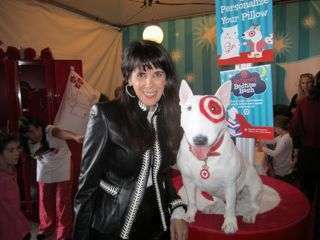 Having my photo taken with the iconic Target puppy dog, complete with a red-painted bullet eye, nibbling on cupcakes and caramel apples, and seeing some of the most creative arts projects for children to enjoy was a treat for those in attendance. For 14 years, parents, kids, and big kids at heart throughout California wait for the Express Yourself celebration.? The annual creative arts fair and family day was held at Barker Hangar in Santa Monica, which was recreated like a circus event with art projects galore. 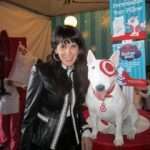 Laurie David, one of the founders of the P.S. Arts gala shared her passion for bringing arts back into the school systems. ?I can?t imagine what like would be like without the arts,? was repeated by most of those in attendance. Sure, I remember going to art class as a child growing up while attending public school. It was one of my favorites. Unfortunately, statewide budgets have eliminated the arts from most of the school systems. With 50 schools benefitting from this organization, kids can have the creativity they need to grow and flourish. California celebrities in attendance with their kids included Debbie Mazur, Marcia Cross, Camryn Manheim, Lisa Kudrow, and Lisa Rinna. Thank you to the entertainment community of Los Angeles, who joined together to make sure that the children in selected schools throughout Los Angeles won?t live an art-free life.